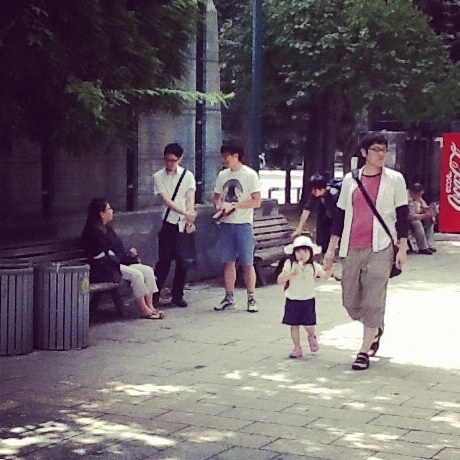 That is how Nakagawa san (pictured w black pants) & 14 other Japanese believers began conversations on the streets of downtown Sapporo, Japan last Saturday. With Bibles in hand, the Holy Spirit in their heart & a ministry partner by their side, they set out to prayerfully seek out people among the 99.6% unreached to share Jesus with. It was exciting to see them be sent out in pairs to lovingly & courageously proclaim the gospel of Jesus Christ to their fellow Japanese. Some were not interested in giving up 5+ minutes but many DID! Among those who heard the gospel, a surprisingly high percentage were interested in studying the Bible! Praise God!! What is more exciting is that these Japanese Christians in Sapporo are growing in the discipling of personal evangelism. We are all learning & growing together. This will lead to multiplication. One of the key steps to a disciple-making movement is that believers in Jesus personally share the good news of Jesus Christ with lost people–sow seeds of the gospel & see where God produces the fruit of saving faith. When someone believes, you disciple them–and that includes training the new disciple to obey Jesus’ command to make disciples (Matthew 28:18-20). This leads to the multiplication of new disciplers which are trained & gathered into multiplying churches. Thus far, 25 Japanese Christians at Grace Church Sapporo have personally shared the gospel with 245 lost people over the past 5 weeks. By God’s grace, we have seen 4 people place saving faith in Jesus Christ (2 more have responded to the gospel but with unconfirmed faith)–and they are being discipled. To give you context, in the previous 52 weeks, 400 people heard the gospel with 10 putting heir faith in Christ. We rejoice that God was working–and we continue to rejoice (245 + 4 in 5 weeks) as God is multiplying disciples through “common” Christians being used by an uncommon God on an incredible mission. Now let’s get personal. In what ways have you allowed God to use you on His mission to reach people far from God with the good news of Jesus Christ? This past year? this past month? This past week? If you have, praise God!! You are among the 2% of Christians who share their faith. Please keep at it & teach others. If you are among the 98% who do not share their faith with others or have not made yourself available to be used by God, why not? What is hindering you? Like Nakagawa, you have God’s Word, God’s Spirit & His Church (other believers). Repent, ask God’s forgiveness for disobedience & then simply ask Him to help you obey. Got 5 minutes…to pray for an opportunity to share the good news of Jesus Christ with a person far from God? Got 5 minutes…to let God use you to share His message of hope, peace & forgiveness? Got 5 minutes…to be a “common” Christian used by an uncommon God on an incredible mission? Try it & see what happens. So encouraging Troy!! Excited to keep asking God for courage and opportunities to share Him. =) Thanks for teaching us what you’re learning. AMEN to sharing your faith! Are you familiar with the 5 Life questions/4 Deadly? Of all the worldviews, only Christianity can answer them all! 1. What do u mean by that? 2. How do u know that is true? 3. Where did you get your information ? 4. What happens if you are wrong?